Here's some great news to share with you from both California and Texas. AB 1634 has passed out of the Senate Local Government Committee and is on track for a full vote in the Senate. The Senate Local Government Committee, chaired by Senator Gloria Negrete McLeod, worked with AB 1634 author Assembly Member Lloyd Levine to craft an amended bill that was acceptable to a majority of the Committee members. The updated text of AB 1634 provides the ability for animal control officers to cite owners for having an unaltered cat or dog, if the animal is the subject of a complaint or an impound. Prior discussions with the Senators on the Committee made it clear that they already understood the broad, statewide support for the bill. We were asked not to overwhelm the Committee with phone calls, faxes and emails, or to bring a large number of people to the hearing. We honored their request, the Senators were appreciative and we thank the Committee for their "Aye" votes. Please stay tuned for the next step for AB 1634 as it moves to the Senate floor. We'll keep you posted as dates become available and when to start lobbying your Senators. Dallas has passed a broad new law that requires dogs and cats in the city be spayed or neutered, unless they are used for legal breeding or law enforcement. In doing so, Dallas joins Los Angeles and other cities across the country who are paving the way to a better future for our pets. According to the Dallas Morning News, "Dallas Animal Shelter Commission Chairman Skip Trimble insisted that the city must move now to reduce the stray and feral animal population. 'It can only be done through sterilization,' he said. 'If we can't control the flow of water, we'll never stop mopping the floor.' The ordinance passed by an astounding 10-3 vote, and "the majority of council members hailed the changes to the animal ordinance as an important step toward reducing the tens of thousands of stray animals roaming city streets, and improving quality of life for pets." Congratulations to Rebecca, Liz and all the animal loving volunteers who worked so hard in Dallas to make this incredible day a reality. You can read more about the Dallas victory for pets here, or watch a video on the new ordinance here. Today, June 3, is a historic day for pets in California. First, Santa Clara County has voted on a resolution to support AB 1634, California Healthy Pets Act. Second, an Orange County Grand Jury has released a report recommending that all Orange County cities adopt mandatory spay and neuter ordinances similar to the Los Angeles law. Santa Clara County today became the first county in California to take a position on AB 1634, as the County Board of Supervisors voted YES to a resolution of support for the bill. The animals in California owe a debt of gratitude to Supervisors McHugh, Alvarado and Yeager, who made this important milestone a reality. Please thank the Supervisors here. In doing so, Santa Clara County joined scores of other cities, organizations and elected officials who are publicly endorsing AB 1634, the common-sense solution to our pet overpopulation crisis. A large group of AB 1634 supporters and shelter workers traveled to Santa Clara to testify in favor of the bill, and the packed room erupted in cheers when the vote was taken. Thank you to everyone who contacted the Supervisors and came to Santa Clara. Congratulations! A press release on the vote is here. In an important new development, a Grand Jury Report released Tuesday recommends that all Orange County cities should adopt mandatory spay and neuter ordinances to address the animal overpopulation problem and decrease the number of animals euthanized at shelters. Orange County is just the latest in a string of communities who are coming to the conclusion that spay and neuter laws are the best solution to save taxpayer money and reduce the number of animals flowing into their shelters. The report is here. The new California Healthy Pets Act billboard campaign has launched, with billboards going up across the state to help educate legislators and the public on the merits of spay and neuter laws. Several designs are used in the campaign and they are already generating a lot of "buzz" around Sacramento, where the billboards direct viewers to visit www.spaythem.com. Thanks to our generous donors who made this campaign possible! Thanks for caring. Together, we truly will make life better for Californians and our furry companions. It's hard to express just how important this email may be... a very important milestone for pets in California is approaching and you can help! Santa Clara Board of Supervisors to Vote on AB 1634 Resolution Coming Up Tuesday June 3rd at 9:30am - Please Join Us or Call Now! As you may know, cities and organizations across California have voted "YES!" on resolutions to support AB 1634, the bill that will save hundreds of thousands of pets and millions of taxpayer dollars. Mayors, Supervisors and City Council members are smart, compassionate people, and the common-sense approach of AB 1634 appeals to them. The Santa Clara Board of Supervisors is poised to join these hundreds of other elected officials by adopting a resolution of support for AB 1634 on Tuesday, June 3rd. But this vote is different than the others in one important way... the breeder groups opposing progress for our pets have decided that this is a big chance to try to make a public statement against spay & neuter before AB 1634 is heard in the Senate. They are sending out mass emails across California, trying to affect the vote in Santa Clara. If you would like to join the responsible and caring animal lovers in Santa Clara to get their resolution passed, here's what you can do. The meeting starts at 9:30, in order to make your voice heard please arrive at 9am and fill out a speaker's card for Item 28a. There will be a large group of proponents for AB 1634 and I sincerely hope you will join us! 2) Contact the Supervisors. It's incredibly moving for the Supervisors to see so many pet lovers standing up to protect animals in person, so again, please join us if you can. But if you can't come in person (or, even if you can!) please contact the Supervisors and politely let them know that AB 1634 represents the best hope in a generation to save hundreds of thousands of pets from euthanasia each year. And please forward this important information to others. I am a volunteer, and so are the hundreds of pet lovers working to help pass AB 1634. We don't stand to gain anything except a better future for our cats and dogs. The needless suffering from pet overpopulation must begin to be brought to end in our great state, we must stand together to make this happen. But there are those in California who see pets in a different light, and we must stand and protect our voiceless friends. Please join us in Santa Clara on Tuesday, June 3rd, I look forward to seeing you there! Here are some updates I would like to share with you. 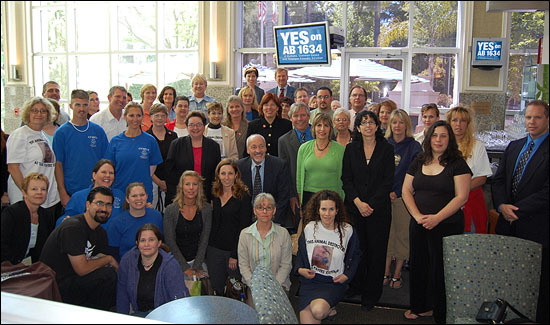 In a demonstration of how strong support for AB 1634 is, and how the opposition to the bill comes primarily from noisy animal exploiters who feel any protection for animals is a threat to their profits, all of the ballot initiatives meant to stifle AB 1634 and progress for California's pets have failed to qualify for the ballot. This is wonderful news for the animals and those of us dedicated to protecting them. The anti-pet forces working in California simply could not find enough people to collect signatures, or donors that would enable them to further their self interests. An article regarding the failed initiatives can be read here. In a news report that is unfortunately being repeated across our state, NBC11 has investigated the reality at Bay Area animal shelters, and found that "the future is grim for hundreds of dogs and cats behind locked doors at the shelter". The NBC story reports that "California euthanized 500,000 Cats and Dogs In 2007", and it's costing our state over a billion dollars every four years just to house and kill pets. The report is available for viewing here. We'd like to thank NBC for their thoughtful coverage of this sad crisis in our state. In exciting website news, the updated video area on www.CAHealthyPets.com now contains over 100 video selections, including supporters, celebrity interviews, AB 1634 commercials, interviews with shelter workers and veterinarians, and national news stories regarding AB 1634. The new video area is available here. Universal spay and neuter is taking the country by storm! Just this week we have seen several new communities around the country start taking steps to curb the crushing pet overpopulation problem by requiring that household pets be spayed and neutered. Cities and counties around the United States, inspired by the new law in Los Angeles and by the groundbreaking AB 1634 legislation, are taking steps to encourage responsible pet ownership! -- And in Ohio pet lovers are now starting a campaign for a statewide spay and neuter law. This is all happening because caring pet lovers (like you!) in California are leading the way for our nation. The number of emails we are receiving from legal breeders who support AB 1634 continues to grow, and the majority of law-abiding breeders in California love their animals and treat them like family. But unfortunately some people see animals only as a profit center and actually make a full time, tax free living by breeding animals in poor conditions, claiming that the pets come from a loving home, and selling them for top dollar without reporting the income. For example, this week CBS 2 exposed yet another case of neglect... over 400 dogs in awful conditions, raised by unscrupulous people who advertised that their puppies come from a loving home. The incredible news report can be seen here. CBS 2 did a follow up story today, you can see it here. One more time... 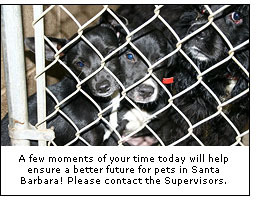 Please help Santa Barbara County Pass Their Spay/Neuter Law! Santa Barbara County's Board of Supervisors is set to vote on May 6th to consider a fair, balanced spay/neuter law. But opponents of responsible pet ownership are sending out mass emails with distortions about universal spay and neuter, trying to convince people to bombard the Supervisors with negative emails. The Supervisors need to hear the truth: that there is strong statewide support for this law, and that Santa Barbara County's animal-friendly reputation will be enhanced if this law is passed! -- Santa Cruz's example proves that these laws work -- their shelter numbers were down 50% nine years after their law passed! -- Santa Barbara should join communities like Los Angeles, L.A. County, Lake County, Santa Cruz, and San Bernardino and pass a spay/neuter law! ...and please thank Mr. Carbajal him for sponsoring the law! AB 1634, the bill to provide universal spay & neuter for dogs and cats in California, continues the journey into law in Sacramento. But local governments across California are also passing local universal spay & neuter ordinances; they are simply fed up with the high cost and moral tragedy caused by massive pet overpopulation. Santa Barbara County is set to soon follow in L.A.'s footsteps by voting on their own universal spay / neuter ordinance. As with AB 1634 and the L.A. ordinance, Santa Barbara's law will save taxpayer money and save thousands of healthy, adoptable pets. Responsible pet owners across the state have already been contacting the Santa Barbara County Board of Supervisors, thanking them for considering this important law. But, just as in Los Angeles and in Sacramento, underground breeders are attempting to flood the Supervisors' offices with phone calls and faxes, trying to create the false impression that the general community is against helping our shelters and our pets. These underground breeders, who often call themselves "hobby" or "amateur" breeders, are already required by law to have a seller's permit and pay taxes on their animal sales. Sadly, few do. And they are afraid that the new Santa Barbara ordinance, like AB 1634, will drag them into the light. In reality, universal spay & neuter is a proven solution that lowers euthanasia rates, reduces pet overpopulation and saves taxpayer money. And, please consider forwarding this email to other animal lovers. This is an important time for the folks in Santa Barbara, and they have specifically asked that AB 1634 supporters across California contact the Santa Barbara Supervisors! Two articles published last week illustrate how vast and costly the pet overpopulation is in California. The articles describe the situation in Kern County, where euthanasia and shelter costs continue to rise, and Orange County, where euthanasia and shelter costs also continue to rise. Officials from both Counties, quoted in the articles, suggest that this problem needs to be solved at a state level. As stated in the article, Kern County is euthanizing over 2 out of the 3 animals in its care, and the residents there are desperate for change in their shelters. Within days of this article's publication, the Kern County supervisors, saying "enough is enough," ordered study of a mandatory spay-neuter rule Tuesday in light of rising animal euthanasia rates. In a local reflection of the statewide situation, the opposition to the Kern County rule comes from breeders and those profiting from the use of animals. Janice Anderson, the commission member quoted in the article as saying the universal spay/neuter is not necessary in Kern County, has been a dog breeder for over 30 years. It is interesting and telling that time after time, in local communities and at the state level, the opposition is overwhelmingly composed of people who use animals for profit. We hope that the ultimate recommendation from the Kern County Animal Control Commission to the Kern County supervisors reflects the responsible pet owners fighting for a better future in Kern County, and is not compromised by those with a vested interest in keeping the status quo intact. Orange County is also overdue for the proven benefits of universal spay/neuter, as this article demonstrates. It points out that many improvements made in Orange County, including a new "pro-life, pro-adoption" stance at the shelter, have failed to stem the rising number of euthanasias, or the rising cost. "Despite the reality of 4,000 dogs (and many more cats) being euthanized each year in Palm Beach County alone, AKC breeders continue to churn them out in search of a prize winner. Anyone who disagrees with mandatory spaying and neutering should spend one afternoon in the kill room of any of our county shelters." Thanks to all the responsible pet owners and pet lovers who are helping make positive changes in our state and across this country. We did it! Mayor Villaraigosa signed into law the largest universal spay/neuter ordinance in the country yesterday morning. I am so proud of the compassionate, thoughtful leadership of the Mayor and the L.A. City Council, and am grateful to have worked with their staffs, L.A. Animal Services and all the incredible volunteers who helped make this historic event possible. Some of the council members are former LAPD officers who know how important this ordinance is to public safety, while other members spoke of the ethical and fiscal aspects of the new law. We will have the full signing ceremony video up on our website hopefully within the week. If you have a moment, please take the time to thank the Mayor and the City Council for their work on behalf of animal lovers and their pets. You can contact them here. Los Angeles is helping us prove that together, we can make life better for Californians and our pets. The official press release is below. Congratulations! New city law requiring all cats and dogs be spayed or neutered will help control LA’s pet population and humanely decrease the number of cats and dogs abandoned and euthanized every year. LOS ANGELES - Pledging to continue the efforts to reduce pet euthanasia and control the City’s pet population, Mayor Antonio Villaraigosa, joined by Los Angeles City Councilmembers Richard Alarcón and Tony Cardenas, Los Angeles Department of Animal Services General Manager Ed Boks, Animal Rights Advocate Bob Barker, Humane Society of the United States President Wayne Pacelle, PETCO Foundation President Paul Jolly and local animal advocates, today signed the Spay/Neuter Ordinance, a new law that requires all pet owners in the City of Los Angeles to have their cats and dogs spayed or neutered. "By requiring that all cats and dogs be spayed or neutered, we can help to humanely decrease the number of pets abandoned and euthanized each year," said Mayor Villaraigosa. "This ordinance, which contains clear guidelines and enforceable penalties, creates a valuable tool to take this city another step closer toward eliminating the unnecessary euthanasia of animals." The Spay/Neuter Ordinance will require all pet owners in the City of Los Angeles to have their cats and dogs (four months of age and older) spayed or neutered, unless otherwise exempted because the animal competes, serves as a rescue or service animal, or unless the pet is a registered breeder. Any person violating the spay/neuter law will be cited, and could be subject to up to a $500 dollar fine or 40 hours of community service. This new law, which aims to assist in humanely decreasing the number of cats and dogs abandoned and euthanized every year, also poses health benefits for the animals as well. Spaying reduces the risk of certain types of cancers and infections in females, especially if it is performed prior to the first heat. Moreover, neutering lessens a dog's temptation to roam, as well as to fight, as studies show that the majority of dog bites are made by intact, untrained male dogs. The signing of this ordinance comes on heels of Spay Day USA 2008, an annual Humane Society of the United States (HSUS) coordinated event, during which, thousands of volunteers coast to coast host activities to educate and assist people with getting their pets spayed or neutered. The new Spay/Neuter law will take effect in April. Feb. 12 (Bloomberg) -- The Los Angeles City Council voted to require sterilization of cats and dogs at four months of age or older, aimed at reducing the number of stray animals the city's shelters kill each year. The ordinance, passed 14-1 today, is also meant to curb illegal breeding, dog-fighting, and hoarders, said District 7 Councilman Richard Alarcón, the sponsor. Los Angeles will become the largest municipality in the U.S. to adopt such a requirement once Mayor Antonio Villaraigosa signs the measure. 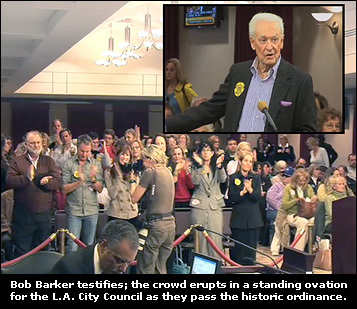 One of the ordinance's biggest supporters was retired game- show host Bob Barker, who for 25 years concluded the ``Price Is Right'' by urging viewers to spay or neuter their pets. He's put about $35 million of his own money toward U.S. programs that subsidize surgeries. "Where would civilization be if we didn't have a few things that are mandatory?" Barker said in a telephone interview from Los Angeles last week. Barker, who will be named by Alarcón to an advisory committee to help with outreach, said the statute won't be a burden on the elderly or poor residents because the city offers about 11,000 vouchers for free surgeries a year and an additional 20,000 in discounts. "The problem in our city is not the animals but the human owners, and this ordinance will allow the Department of Animal Services to target resources toward the worst offenders," Alarcón said before today's vote. Opponents, including District 11 Councilman Bill Rosendahl and members of Concerned Dog Owners of California, raised a variety of questions, from the health effects of early spay- neuter surgery to the infringement on personal property rights. Rosendahl was today's lone "no" vote. "We need to get more people responsible by getting them within the map of registrations of the animals," Rosendahl said during a Feb. 1 hearing. State Assemblyman Lloyd Levine, who introduced a similar bill at the state level in 2007, attended the Feb. 1 hearing. He said that California ends up killing more than 500,000 of the million animals its jurisdictions take in each year. More than $300 million is spent on animal control services, including disposal of animals that are put down. "I find that a fiscal catastrophe and a moral crisis," he said at the hearing. His bill, AB 1634, made it through the state Assembly and is pending before the Senate. More than a third of the 45,875 animals impounded at Los Angeles shelters last year were killed. "Thanks to the leadership of Councilman Alarcón, the City of Los Angeles is taking a crucial step towards increasing the practice of spaying and neutering our pets and reducing our homeless pet population," Villaraigosa said in a statement. While it costs $135 to euthanize a cat and $195 a dog, it costs $60 to $80 to spay or neuter them, according to Los Angeles Animal Services General Manager Ed Boks. "Despite the fact that we have achieved tremendous success in reducing the killing in our shelters, the number of intakes has remained relatively stable, making all our efforts a bit like running on a treadmill," Boks said in an e-mailed statement before today's vote. The Animal Services Department's Web Site shows the city's euthanasia rate declined to 33 percent last year from 56 percent in 2002, while the number of impounded animals averaged 49,400 in the five-year period. Los Angeles aims to be a "no-kill" city by the year 2010, Boks said. The bill has seven categories of exemptions, including licensed breeders and show, guide and law-enforcement dogs. Spaying and neutering surgeries may also be delayed for medical reasons or due to age, with a veterinarian's letter. "This is going to be a complaint-based system," Alarcón said. "If you manage your animal properly, then it's not going to be a burden." To contact the reporter on this story: Nancy Moran in New York at nmoran@bloomberg.net. Together, we can make life better for Californians and our pets. Using many of the same compelling arguments that are convincing state legislators, the California Healthy Pets Coalition has successfully helped pass a Los Angeles spay/neuter ordinance similar to AB 1634. The L.A. City Council passed the measure 10-1, making Los Angeles the largest city in America with a universal spay/neuter policy. Like our bill AB 1634, the city measure, sponsored by Councilman Richard Alarcón, offers exemptions for animals belonging to licensed breeders, show animals and service animals. Exemptions are also provided for age and health reasons, as attested to by the pet's veterinarian. More than 100 California Healthy Pets Coalition supporters filled the City Council chambers in Van Nuys for the debate and vote on the ordinance, outnumbering opponents by more than 5-to-1. Councilman Tony Cardenas said, "The cost to euthanize a cat or dog is $145 to $195, that's the estimate. We all want to be a no kill city, this is the most humane way to prevent the killing of animals. Tens of thousands of animals are killed in this city. Assemblymember Lloyd Levine is carrying this at a state level and just reminded us that 500,000 cats and dogs every year [are killed] that means a million every two years. That is unconscionable." Only Councilman Bill Rosendahl voted against the measure, offering weak and tired arguments that have been thoroughly debunked over years of debate about the benefits of spay/neuter laws. Bob Barker, who has demonstrated his personal commitment by donating millions of dollars for spay/neuter services, led the parade of speakers in support of the ordinance. "Mandatory spay/neuter is a necessity," Barker told the council. "For decades, I closed every 'Price Is Right' urging viewers to have their pets spayed. I'd like to think all of us working together would be enough. But it's not enough. We need legislation." Barker was joined by Assemblymember Levine, who reminded the council that half a million dogs and cats are euthanized in California shelters each year, a number that would be dramatically reduced with an effective statewide spay/neuter law such as AB 1634. The feeling in the room was perhaps best summed up by our very own Elizabeth, an animal rescuer who serves as one of the coalition leaders: "I would like my taxes to be spent on something other than the housing and killing of animals." The L.A. City Council action is another big step along the road to passage of AB 1634, which will be considered by the State Senate later this spring. Compassion ruled the day! "...California pet lovers prepare to do battle, again, over a bill that calls for mandatory spaying and neutering. At stake is nothing less than the lives of hundreds of thousands of cats and dogs." That's how a recent DogTime feature story begins. The story traces the development of AB 1634, from animal rescue experiences in the wake of Hurricane Katrina in New Orleans, to the current battle for the bill's final passage in the California Legislature. On Friday, the Los Angeles City Council will consider a common-sense, effective spay/neuter ordinance - responsible pet owners need to be there and show support. The scheduled 10:00 a.m. hearing this Friday, February 1, on the proposed Los Angeles city spay/neuter ordinance is critically important. Responsible pet owners and those who truly care about the welfare of animals must plan to attend - or make their views known to the council members BEFORE the hearing. Opponents - including irresponsible, unlicensed and uncaring breeders - are already organizing to kill the new law. They plan to flood council offices with complaints about the proposal and pack the council chambers, shutting out the voices of responsible pet owners who support common-sense spay/neuter laws. The proposed ordinance for Los Angeles - approved Monday by the council's Public Safety Committee - would require most dogs and cats in the city to be spayed or neutered by four months of age. The ordinance includes exemptions for show animals that have competed in at least one legitimate show or sporting competition; dogs working or other title; guide, signal or service dogs; dogs that are actively used by law enforcement agencies; and animals with valid breeding permits. CBS News reports: "The proposed ordinance is intended to reduce the number of animals in the city's shelters and decrease the rate of euthanasia, which costs the city about $2 million a year." "This ordinance gives us the tools to end the insanity and do something significantly different," said Ed Boks, general manager of the Department of Animal Services. "This law would help to end the cycle of frustration we all face and feel every day and allow us to eventually reallocate precious resources for increasing adoption, educating the public on humane issues and fighting animal cruelty." If you are a Los Angeles resident, please call the offices of your council member on Wednesday or Thursday. On Friday, plan on attending the council session at 10:00 a.m. - it appears there WILL be a public hearing and comment period where we can voice our support - either at the Van Nuys City Hall (14410 Sylvan St., Van Nuys, at Van Nuys Blvd. ), or in the City Council Chambers at Los Angeles City Hall (200 North Spring St., Los Angeles). Go to www.lacity.org/council.htm for info on ways to contact council members by e-mail. As a responsible pet owner who truly cares about the welfare of animals, PLEASE call your council member on WEDNESDAY or THURSDAY and then attend the City Council hearing on FRIDAY, February 1, at 10:00 a.m. Together we can make life healthier and safer for Californians and their pets. Responsible pet owners, taxpayer advocates, law enforcement professionals and others are intensifying their efforts to pass AB 1634, the California Healthy Pets Act, authored by Assemblyman Lloyd Levine. AB 1634, the common-sense, humane and taxpayer-friendly solution to California's massive pet overpopulation problem, was passed by the State Assembly in 2007. That legislative victory was an enormous win for pet owners and taxpayers across the state. The measure now moves to the Senate Local Government Committee. The California Healthy Pets Coalition and California Taxpayers for Safe and Healthy Pets have been working tirelessly to make sure Senators get the facts about the pet overpopulation crisis and how AB 1634 can help solve the problem while saving taxpayers millions of dollars annually. Since AB 1634's Assembly victory, tens of thousands of Californians have joined us in calling for the bill's passage, and the coalition has been increasingly successful in focusing media attention on this expensive and heartbreaking problem. Meanwhile, communities throughout California and in other states have added to the drumbeat for change by advocating responsible spay and neuter laws that will help pets and shelter workers, as well as taxpayers. Last month the southern Nevada city of North Las Vegas, with 200,000 residents, became the first community in that state to pass a law requiring residents to spay or neuter their household pets. Clark County, the largest county in Nevada, is also considering spay and neuter legislation, after demands by law enforcement that the county take strong action to deal with pet overpopulation and the strain it puts on police resources. While our neighbors in Nevada take the lead on implementing responsible spay and neuter policies, we can't let California fall behind on this important issue. And with AB 1634 now before the California State Senate, YOU can join California's responsible pet owners, humane and rescue organizations, taxpayer advocates, law enforcement professionals, animal control agencies, and veterinarians in urging the passage of the bill. As one last news note, it seems incredible, but the Sacramento Bee is reporting that the mortgage and foreclosure crisis is creating a new wave of pet abandonment across the country. The Bee's January 19, 2008, story "Mortgage crisis is hurting pets, too" says: "As thousands of area families surrender to foreclosure their dreams of owning homes, many are also leaving their dogs and cats behind. Area shelters are filled with animals surrendered in recent months by people forced to move to apartments or other places where their pets are unwelcome, and managers are blaming the housing meltdown for the surge." The Sacramento SPCA told reporter Cynthia Hubert that they have seen a more than 100 percent increase in dogs dropped at shelters by people who said they are moving for financial reasons and could no longer have pets. In Placer County, shelter officials said that currently "at least 20 percent of dogs and cats surrendered to the shelter came from people who 'lost their homes or were having such extreme financial difficulties' that they could no longer afford to care for them..."
Just one more reason to pass AB 1634 and end the strain on California's shelters. Together we can make life healthier and safer for Californians and their pets.